Two lucky readers will win either the Oasis or the Q2! Read on for details. I've said it before, and I'll say it again. I hate wires. They're cumbersome, always getting tangled in things, and half of the time you grab the wrong wire anyway. I love the freedom of movement afforded by Bluetooth headsets, the ease of paring the headsets, and the myriad voice responses built right in. Audio instructions, automatic pairing mode and a thankfully abset "Enter Code 0000" made for a surprisingly pleasant experience, pairing the devices with my BlackBerry. In the past, I've written about Stereo Bluetooth Headphones; today, I'm taking a look at two Bluetooth headsets: the Motorola Oasis and the BlueAnt Q2. Both impressed me with their signal range, call quality and comfort. In the end, there could be only one winner. 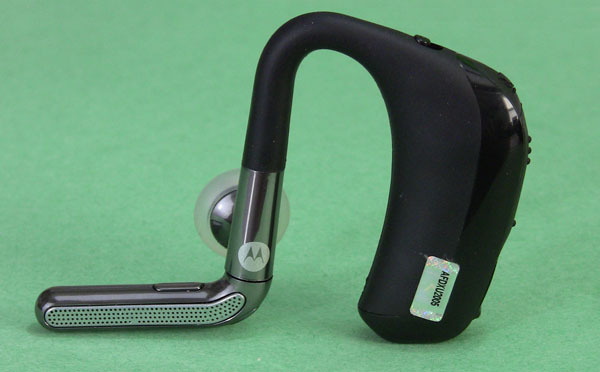 The Motorola Oasis fits comfortably on the ear. Unlike many recent headsets, the Oasis sits over the ear, rather like a very stylish hearing aid. The weight of the headset rests on the outer part of the ear, rather than the ear canal like the Q2. Thus, it is easier to wear the headset for an extended amount of time. The controls on the headset are not the easiest to use. Almost all the controls are located on the back of the headset, requiring a reach behind the ear. It is the logical place to put the controls, they just aren't easy to get to. The call control, which I had a difficult time finding when answering a call, is located on the microphone arm. The BlueAnt Q2 has some of the best controls I have ever enjoyed on a Bluetooth headset. Except for raising and lowering the volume, all the headset's functions are voice controlled. Want to turn the LED on? Tell that to the Q2. Reject an incoming call? Just say, "ignore." Like the Oasis, the Q2 easily accesses your BlackBerry's voice dialing; just say, "phone commands." BlueAnt does an excellent job of offering a fully hands-free call. After pairing, the Q2 downloads a copy of your phone book. When calls come in, you're told who is calling and given the option to answer or ignore. Without taking your eyes off the road or your hands off of the steering wheel, you're able to know your caller and respond to the call. In addition, BlueAnt goes out of its way to promote Vlingo's free SafeReader (now a part of Vlingo - Virtual Assistant) for texts and emails. Again, promoting a fully hands-free experience. Though the headset only has three buttons and a switch, they are - for the most part - easy to get to. The call button on the side and the volume buttons on top are certainly easy to navigate by even the largest of thumbs. The power switch is tucked back against the ear. Unless you have some sharp fingernails, you'll want to turn on the Q2 before placing it in your ear. Both the Oasis and Q2 offered easy to follow audio instructions for pairing with your BlackBerry, and I was pleasantly surprised to be spared that whole "Enter code 0000" bit. The Q2 offered more step-by-step instructions, but both devices automatically put themselves in pairing mode and gave voice directions on how to proceed. Both the Oasis and the Q2 performed surprisingly well in signal tests. In order to judge how well the device worked at range, I placed my paired and connected BlackBerry on a box and started to walk away. When the signal faded, I placed a flag to mark the edge of each headset's range. To get a good data sample, I did this five times for both the Oasis and Q2. After a few runs, a pattern began to emerge; one headset was outperforming the other. For these tests, I was in open air with no other electronics, walls, or other obstructions. That being said, both headsets performed well over their rated range of ~33 feet (10 meters). For the majority of the tests, the Q2 was just beginning to shows signs of crackling at 50 feet, while the Oasis lasted until 90 feet. Incredibly, twice the Oasis lasted until 120 feet; and once, the Q2 still functioned well at over 200. When you purchase a Bluetooth headset, you'll probably want to immediately connect it to your BlackBerry and go for a drive. 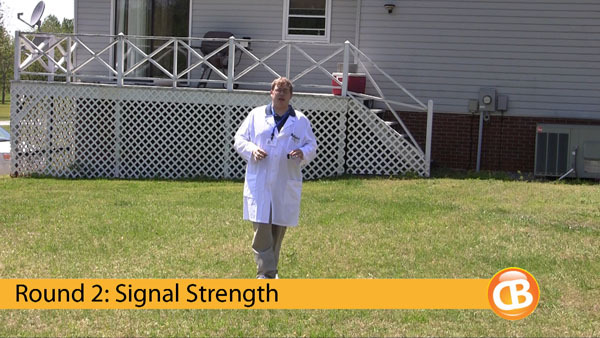 Both headsets tout superior noise and wind reduction technologies, so I put them in the test. As I rolled down the highway, Google Voice helped me to record calls from both headsets. Both performed well at reducing sound while riding in a car and with the window slightly opened. When the window is fully opened and a whirlwind of noise and well... wind enters the car, a clear winner emerges. Though the Q2 does a decent job at this level, the Oasis just does it better. It's pretty loud with that window down; I couldn't even hear myself. But the Oasis could. Because these are both excellent Bluetooth headsets, it is difficult to pick a clear winner. In this situation, I believe it best to go back to the basics of a Bluetooth headset. Which headset gives the clearest call quality in all situations? Which affords me the greatest range from my BlackBerry? Because of its superior call quality and range, I declare the Motorola Oasis to be the winner of this versus challenge. As I say in the video, don't discount the Q2 just yet. The Q2 offers a much more hands-free experience. Calls are answered and settings are changed simply by speaking; there are no cryptic series of buttons to press. Unlike the Oasis, the BlueAnt Q2 supports A2DP. Your calls, music, and even podcasts can come right through the headset. In the end, the choice is yours. While the Oasis offers better call quality and range, the Q2 offers a superior hands-free, voice-controlled experience. Which is the better headset? That's your decision to make. I will tell you this. When asked which one I'm keeping, I immediately responded, "the Q2." Contest: Want to get one of these for free from ShopCrackBerry.com? Just leave a comment to this review and tell us which headset you feel won this competition and why. Contest ends this Sunday at midnight PST. Please only leave a single comment. Two lucky winners will get either the Motorola Oasis or the BlueAnt Q2 shipped direct from ShopCrackBerry.com.